Over the past year or so I have become pretty obsessed with make-up setting sprays. It happens to the best of us, we spend ages getting ready and achieve the perfect party look. Once you start dancing, you get a bit shiny and come midnight you have panda eyes and your blush is no where to be seen. Setting sprays work wonders for this, not just nights out but busy days at work and even weddings. Basically any situation where you don’t have the time to keep reapplying and just want to look how you did when you first put your make-up on. If you don’t already own a setting spray, this could be a life changing moment for you. Rather than avoiding pictures at the stroke of midnight and running like Cinderella you’ll be camera ready and confident. A setting spray is like a hairspray for your face, keeping you shine-free and your make-up intact. 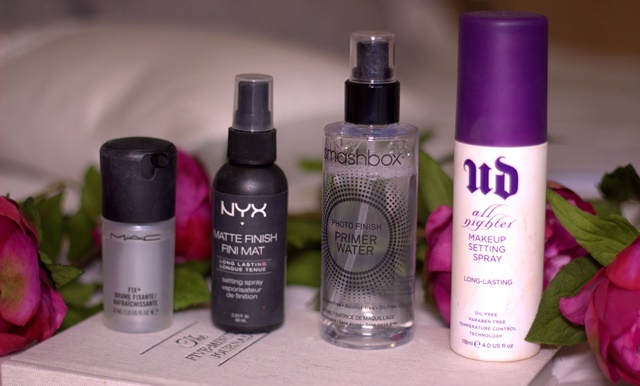 As I said before I am obsessed with setting sprays and here are my favourites ones, but which is the one to get us all through the party season? 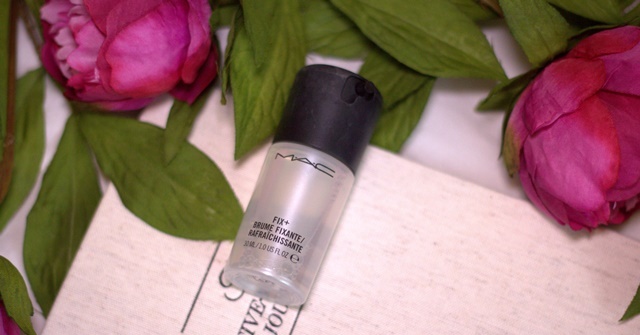 MAC Fix + used to be the must-have product for every make-up artist. Don’t get me wrong it is a great product but it is not a setting spray. It is great for wetting your brush or sponges for make-up application, especially when using pigments or wet eyeshadows so the product really sticks. It feels hydrating on the skin, so it’s nice to use as a refreshing spray every now and then. At £17 it gives you an instant skin boost but I wouldn’t say it sets your make-up, it is a cult favourite though and like I said I have my uses for it, keeping it firmly in my make-up kit. The Smashbox Primer Water is a well-loved product by me! I use it the same as I would the MAC Fix + but it does feel more hydrating and I favour this when spraying my face all over before applying make-up. It is good for giving you that ‘finished look’ but I wouldn’t say it is a setting spray as such. It helps my make-up to stay looking fresher for longer but not all night. I love this product for times when I have to do make-up on make-up for the evenings, I wet my beauty blender with the Primer Water and tap all over my face then apply what I need on top. This way I don’t looked too caked and my make-up looks freshly done. For £20 this is like energy and hydration for your skin and if you love this you will love the BB Water. 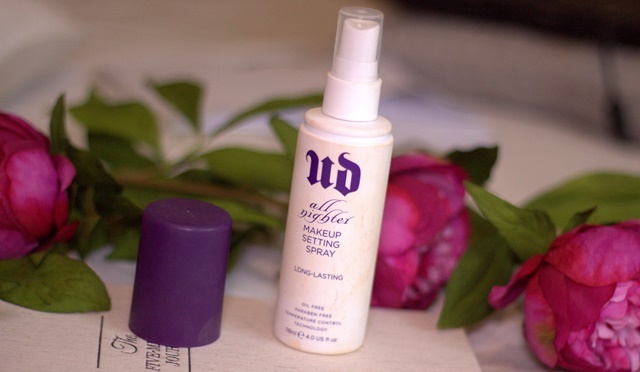 Now we’re talking, the Urban Decay All Nighter Setting Spray is amazing for keeping your make-up locked in! I have reviewed it on my blog already here so I don’t want to go into too much detail again. For £21 it is more pricey than the other two products I have mentioned but when you come home at 3am you will look the same as when you went out at 9pm (trust me I’ve tried it!) If I have spritzed myself with a setting spray, all I need to touch up is my lipstick and perfume. 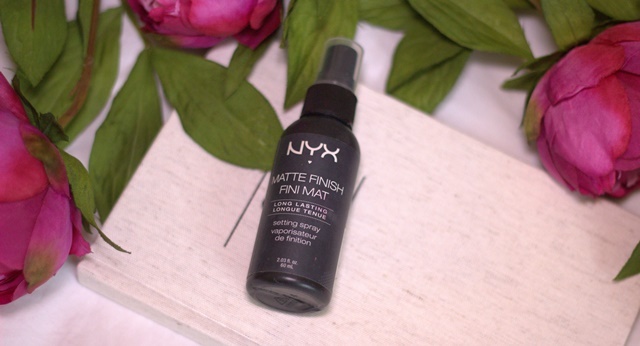 It was a tough choice between the All Nighter and the NYX Matte Finish Setting Spray but due to price this one wins. I use this every single day and my make-up lasts! The Matte Finish Spray just feels a little bit more lightweight compared to the All Nighter but there is hardly any other difference. Honestly, I have gone out to dinner then danced the night away and when I have come home to look like I have just done my make-up. This is the must-have to get you through the party season! I’ve used the Urban Decay one but I’ve found that even using that one, oil breaks through my foundation and ruins the make up on and around my nose. It’s pricey though so I might have to try the Nyx one! Try the NYX one! It is fab!